My latest piece, “Synchronized Synchronous Fireflies,” is coming along nicely. I have added some synchronized grass – regular grass would have looked weird, I decided — and started the threadwork. The shot above shows it pinned to interfacing (Pellon 910), with a bit of the thread sketching done. I have also added smaller circles of lime green Angelina on top of the green Crystalina fibers that make up the fireflies’ glow. They were not showing up quite as much as I wanted with just the Crystalina. I am having fun with this piece, but it is very different from what I’ve been doing in the past year or so. More playful perhaps, and definitely less realistic. 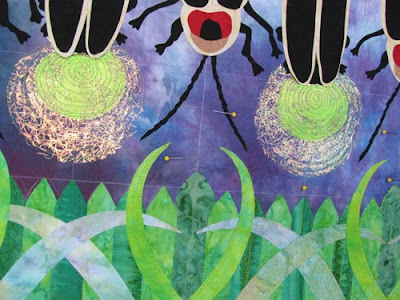 I added the grass to give the piece some more luminous color, and I love the way it glows against the blue twilight fabric, and how it plays off the fireflies’ glow. But there is something somewhat sinister in the way everything is perfectly aligned. It gives me the same chill up the spine that much of Jane Sassaman’s work does. I think it has to do with taking the marvelous chaos that is nature, and making it mechanical, clinical — more perfect, and at the same time, less perfect. Messing with the work of the Creator. The Stepford Wives effect. There is some malevolent intent here. This may go back to my childhood battle with poison ivy. I am incredibly allergic to poison ivy, and had many very bad cases of it when I was young – so bad that I had to have monthly shots as a child, and that I missed several weeks of school. But that is enough psychoanalysis for today. 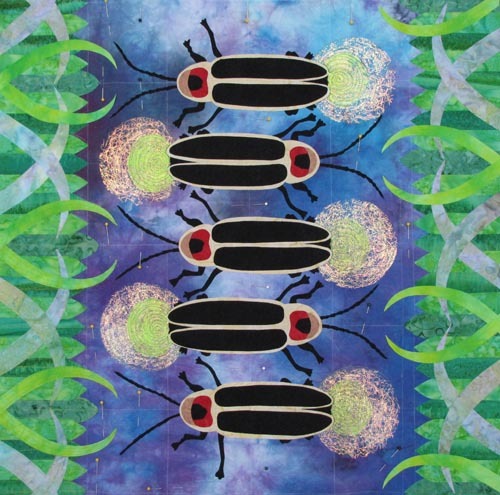 This is one of two pieces I am doing for Fiber Art Options’ exhibition called “Meadowood Stitched,” which will premiere this fall at Daniel Stowe Botanical Garden near Charlotte. All the pieces will be based on meadow life, to celebrate the opening of a new section of the garden that includes meadow and woodland. 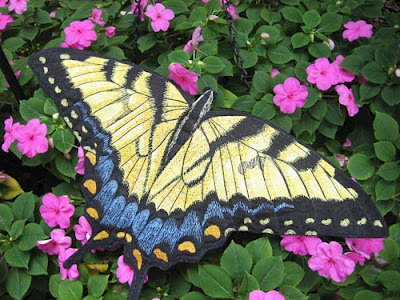 I have a good idea for my second piece; I will be using (or as they say in the crafting world, “repurposing”) a three-dimensional Eastern Tiger Swallowtail butterfly that I made about 5 years ago. He has a wingspan of about 20" (the photo below shows him sitting on my impatiens. Stay tuned! Amanda Jensen is winner of Bead Book. Amanda, please send me your snail mail address and I will send you the book.